People who have heart failure sometimes develop an arrhythmia, an abnormal heartbeat, which can lead to symptoms such as shortness of breath and fatigue. In some cases, medication can help with the symptoms, but in other cases, cardiac resynchronization therapy (CRT), also called biventricular pacing, may be recommended. CRT can greatly improve blood flow and cardiac efficiency so many people with heart failure experience relief from symptoms and improved quality of life. 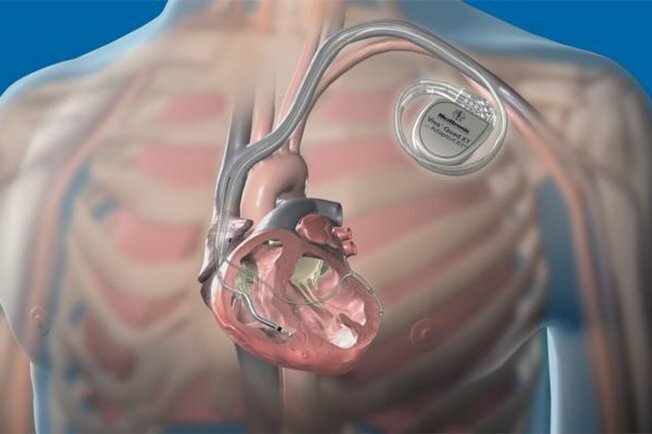 CRT involves the use of a special (biventricular) pacemaker to reset or resynchronize the beat of the heart by causing the ventricles to contract normally. The pacemaker device is implanted just beneath the collarbone, and the leads (tiny wires) that connect from the device (the pulse generator) are connected to the ventricles. The wires send electrical impulses to the ventricles to correct the abnormal heartbeat. The procedure to implant the pacemaker takes about one to two hours. You will be able to walk around soon after the procedure and within about a month you’ll be able to resume your usual activities. You will need ongoing monitoring to ensure the device is functioning properly and to check for any cardiac abnormalities. You’ll also need regular visits with your doctor to check the pacemaker functionality and battery of the pacemaker. If you have heart failure and your medications are not relieving your symptoms, talk to your doctor about your concerns and whether CRT may be an option for you.